The Aria model in SaddleBrooke Ranch Villas is a great choice as a lock and leave winter home. The SaddleBrooke Ranch Villas put “retire” in retirement. All maintenance is taken care of by the Villas HOA. Yes, the HOA fees are higher when you own a Villa, but it may be well worth it. With 1,500 sq. 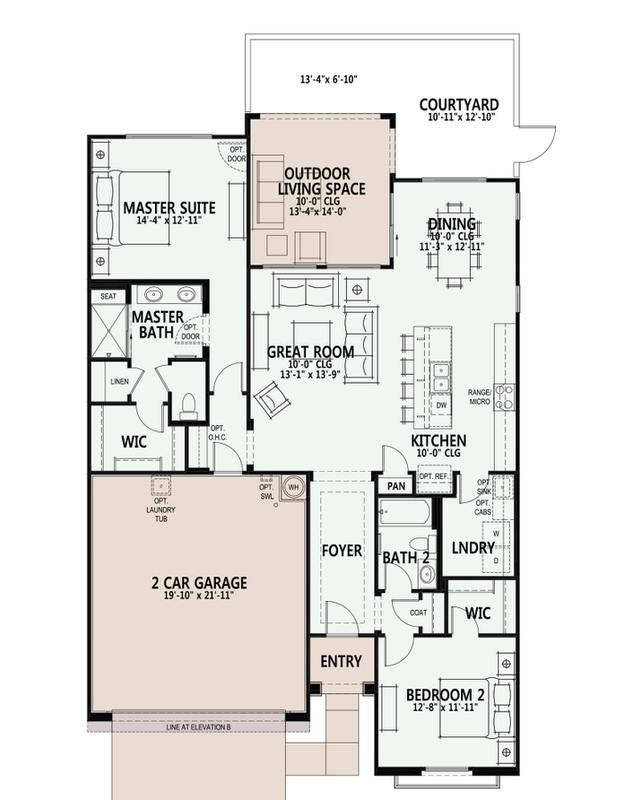 ft. of living space the Aria home is an open floor plan with split bedrooms. And the 2nd bedroom has it own walk in closet. You winter guests may not want to leave. The SaddleBrooke Ranch Villas Aria Floor Plan offers 3 elevations for architectural styling choices. Considering A Home Or Villa In SaddleBrooke Ranch? Are you thinking of buying a home in SaddleBrooke Ranch or another 55+ adult community? If so the SaddleBrooke Ranch Villas Aria model may be what you are looking for. If not, there are other options. Build one of the other model homes or look for a resale. We will help with both option.